Molde was in the lead against the play after 45 minutes. The Norwegian side had 9 players in the stand not able to play, but still managed to keep FCK from scoring, and 2 minutes before the interval Ottar Magnus Karlsson scored after a great counter attack. 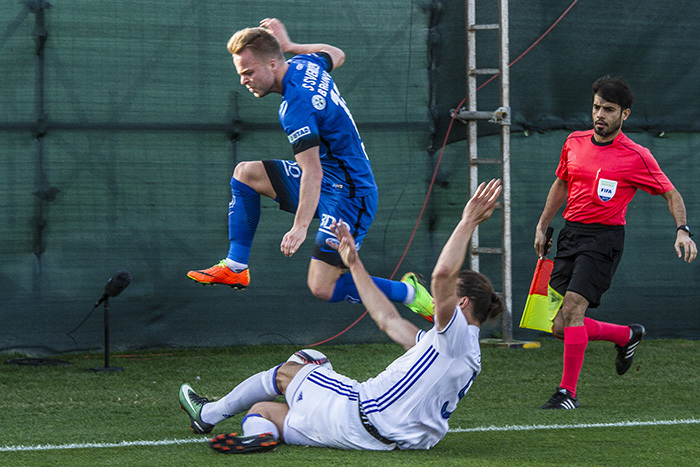 FCK came very close but Rasmus Falks effort was saved by goalkeeper Neydson da Silva who came on for a injured Andreas Linde after 28 minutes. After the break the play was a bit more even, FCK had the most of the ball but Molde was dangerous on their breaks. With a little over 15 minutes to go Copenhagen got their equalizer through a great header from Jores Okore. The 90 minutes ended in a draw and for the second time today it was a penalty shootout. The Molde goalkeeper Neydson da Silva made two great saves from Tom Høgli and Andrija Pavlovic, and when Molde only missed once trough Fredrik Aursnes, Sander Svendsen stept up and converted the winner. Joona Toivio, Christoffer Remmer, against his old club, and Ottar Magnus Karlsson also scored for Molde. Jan Gregus, Benjamin Verbic and Nicolai Boilesen did the job for FCK. Ole Gunnar Solskjaer: I am proud of the players. Ståle Solbakken: Glad there is ten more days till the league starts. Ottar Magnus Karlsson: It is great to play with Sander Svendsen.